Don't you hate it when commas, and punctuation, are misused? Grammar guru Richard Lederer, together with John Shore, has put together a very useful punctuation guide, hot on the heels of Lynne Truss' fabulous "Eats, Shoots & Leaves". There's still hope for the many people who've converted to the text messaging way of communicating and "writing" - this book is going to bring you back to the real world where you'll be able to correctly write your own biography, Ebay advertisements, and notes to Granny in an intelligible way. Learning to punctuate correctly is important when writing, like it or not. The authors explain the period, question mark, exclamation point, comma, semicolon, colon, dash, apostrophe, quotation marks, parentheses, brackets, hyphens, and the ellipsis. They've also compiled a Cheat Sheet for easy reference. There's no excuse for bad punctuation - all the answers to punctuation are here. As usual, Lederer's book is littered with good-natured humor. Conclusion - A very useful reference book for all writers. 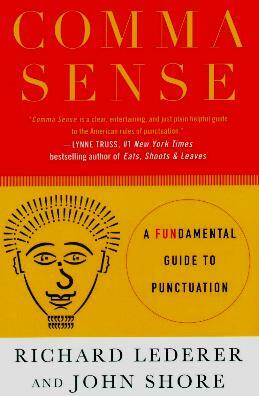 "Comma Sense is a clear, entertaining, and just plain helpful guide to the American rules of punctuation." - Lynne Truss, #1 New York Times bestselling author of "Eats, Shoots & Leaves.